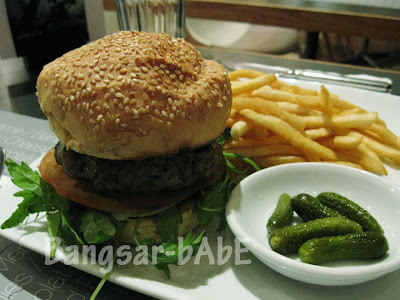 Last Sunday, I didn’t feel like going to our usual makan places, so rif suggested Alexis Bistro. We sat inside the restaurant, where it’s quieter and perfect for engaging in conversations. I ordered the Alexis burger. 200g of beef with medium doneness, topped with blue cheese on top of a bed of fresh rocket leaves and tomatoes, and sandwiched between 2 herb-buttered burger bun. The burger came with a side of fries and pickled gherkins. I ate the fries with some mayo and chili sauce. Freshly fried, they were absolutely moreish. The burger was one of the better burgers I’ve had. 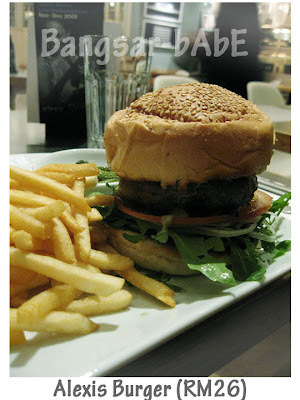 The thick, juicy beef patty contained bits of mushrooms, and the blue cheese shavings gave it a more intense flavour. rif had the Nasi Istimewa Alexis. Pyramid shaped rice infused with kaffir lime and garlic, grilled ikan kembong, beef rendang, fish crackers, eggplant sambal and kerabu pucuk paku, it was a hearty portion. 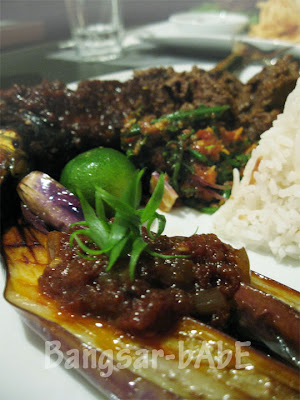 The eggplant was tender and sweet; the grilled fish was well prepared with a lovelv hint of lemongrass. The beef rendang was quite tasty, but I wished the beef had been more tender. For dessert, we shared a slice of Tiramisu. It is supposedly one of the best tasting tiramisu around. I love the caramelized mixed nuts and the sponge fingers, soaked with cognac and coffee had a nice texture. Every bite was divine. Dinner cost RM73.60 inclusive of service charge and tax. A little on the high side, but still worth checking out. 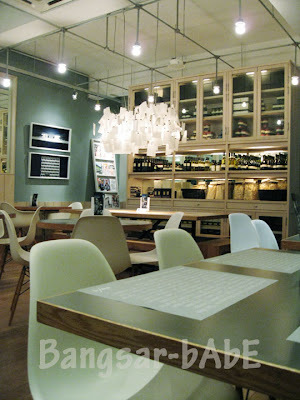 Verdict: A nice chill-out place that serves pretty good food, especially desserts. The nasi istimewa looks delightful! I’d have to be really hungry to eat the way you guys do! Hmm.. the food in the pictures look very yummy. Thanks for dropping by! The food in Alexis is not bad, give it a try! its one of those places thats pretty good and to go to when u got no idea where to go. the tiramisu is pretty darn good! You forgot to try the pavlova – every girl's delight. This is one of my secret dating places for desserts.